The 13519 is a 3.6 Vdc, 1.2 Ahr, 1/2 AA size cell battery. The 13519 fits inside a CR800, CR850, CR1000, or CR3000 datalogger. This lithium battery powers the clock and SRAM when the primary 12 Vdc power supply is not connected. The 13519 is also used in many of the Campbell Scientific water samplers. The 13519 needs to be periodically replaced. Users can replace the battery by following the process illustrated in the product manual. Typically, the battery is replaced when its voltage is at or below 2.7 Vdc. If a data logger has not been used in a while and the internal battery is low, will the battery recharge if the data logger is connected to a power supply? Or does the battery need to be replaced? The internal battery is not rechargeable. In the case of low internal battery voltage, data will only be maintained as long as a power supply is connected. Collect all data from the data logger before disconnecting the power. Then, replace the internal battery. For the CR800, CR850, CR1000, or CR3000 dataloggers, use the 13519 replacement lithium battery. 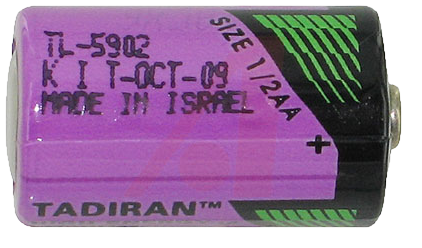 For the CR5000 datalogger, use the 13497 replacement lithium battery. For the CR9000X and CR9000XC dataloggers, use the 8025 replacement lithium battery.